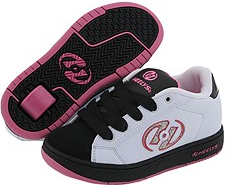 Heely’s are back at 6pm and they are only $16.95 or less for Today Only. These shoes just crack me up. I know they are so popular because I am always seeing kids rolling around the stores. Honestly, I would love a pair. Imagine how quickly I could shop. Could you just see me with my coupon binder in my shopping cart rolling around the store. What a sight. 🙂 I think I’ll stick to shoes.